She was outstanding as a sophomore. Kanani Herring captivated friends and foes alike by leading the Kamehameha Warriors to a state championship last year. Nobody could have topped that performance except Herring herself. The 5-foot-10 junior elevated her game this season, helping the Warriors capture their second state championship in a row. Whether it was at the net with a roof or in the back row with a sensational dig and perfectly placed pass, or firing bazookas from everywhere, Herring did everything and more than was asked of her. The talented outside hitter was voted player of the year for a second consecutive season by a panel of coaches and media. Joining Herring on the first team are three teammates, three Punahou Buffanblu and a Moanalua Menehune. Punahou's Larissa Nordyke, who had 19 kills in the thrilling state final, was also voted first team as an outside hitter. Elizabeth Kaaihue, Punahou's powerful, multi-faceted senior, landed on the first team as an OH. Sydney Yogi made the first team as the state's best defensive specialist. 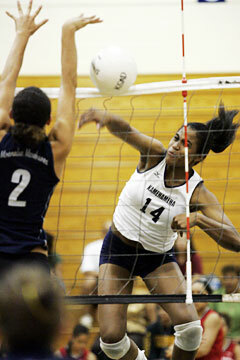 Kamehameha's other first teamers are opposite Logan Keala, middle blocker Bekah Torres and setter Kealohilani Kea. Moanalua junior Kaleinani Kabalis, one of the top all-around players in the voting, was selected as a utility player. Kaaihue, Kea and Nordyke received votes in the POY voting, well behind Herring, who was a near-unanimous winner. 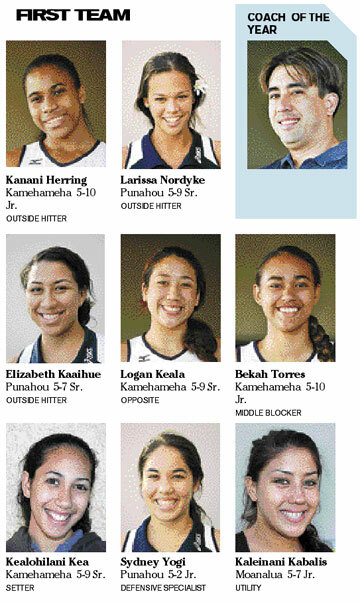 Kamehameha's Chris Blake edged Punahou's Jim Iams by the narrowest of margins for coach of the year. Iolani coach Jenic Tumaneng searched high and low for an adequate strategy to stop the high-flying Herring. "You can't really make a game plan against her at this level. All you can hope is other teammates aren't playing well." Junior outside hitter Kanani Herring led Kamehameha to a 36-2 record and a pair of state championships in the past two seasons. » Always talented, Nordyke emerged in full force as a senior with a relentless, unyielding aggression. "She's always been a great athlete," Blake said. "We played against her for four years. She played really, really well." » Two years ago, Kaaihue stepped up for a Punahou team that had some early struggles in the state tourney, and the Buffanblu went on to win the state title. This year, her myriad skills, combined with Nordyke's performance, pushed Punahou to the state final. There, Punahou gave Kamehameha a marathon battle, winning the first set 37-35 before losing in three. She finished that match with 14 kills and 14 digs. » There was no other opposite more reliable and consistent than Keala. "She's definitely a great worker. It's a great recognition for her to be on the team. She does a lot of little things that don't show up on the stat sheet. A good blocker, good on defense," Blake said. "When she was called upon, when some of the team was off, when she gets the set, she puts the ball down." » Torres gave the Warriors an outstanding blocker, but her ability to hit from both sides of the floor and her dominant serving were undeniable. "She's another girl who accepted the role that we gave her," Blake said. "If we put her at that spot, she would be one of the best outside hitters in the state. She's very mobile, very versatile. We gave her the ball front row, back row. The biggest change was her ability to serve-receive, so we kept her in the back. She did a lot of things that helped us be successful." » Consistent, precise and verbal, Kea was the classic, quintessential senior leader for the Warriors. At 5-9, her ability to block gave Kamehameha an added boost en route to its second straight state championship. "For us, she was dealing with the weight of the expectations of the team. She did a great job of distributing the ball to the people we needed to when the time was right," Blake said. "Her goal was to isolate the hitters based on the matchups, and she was much more cerebral this year. There are ups and downs, and she does a great job of not allowing the downs to get the team down." » A second-team selection last year, Yogi emerged as the best libero in the state this season. "She's just a great defender. She has the same steady play every time," Blake said. "We scheme and try to get our serve-receive away from her. If the ball goes to her in the zone, she's on the spot every time. She's really quick and reads really well. Playing on the national team helped her tremendously." » Early in the season, Moanalua had its share of ups and downs against elite teams, but Kabalis was one of the reasons why Na Menehune rose to prominence by postseason. Her explosiveness, passing, defense at the net and in the back row, and even her occasional setting all contributed to an outstanding year. "Dynamic. She's a very, very confident player. She's one of the best attackers in the state," Blake said of the 5-7 junior. "For what she does and her size, she's just a great volleyball player and comes from a tradition of players." Pos. Name School Ht. Yr.
OH Lauren Minkel Iolani 5-8 Jr.
OH Jordan Meredith Kamehameha 6-0 Jr.
OH Precious Salazar KS-Hawaii 5-10 Sr.
OP Anuhea Keanini Punahou 5-6 So. MB Shawna-Lei Kuehu Punahou 5-10 Jr.
S Kapua Kamana'o Iolani 5-7 Sr.
DS Kelly Pang Iolani 5-3 So. OH Haililani Pokipala Sacred Hearts 5-9 Jr.
OH Brianna Amian Moanalua 5-9 Sr.
OH Chanteal Satele Word of Life 5-10 Jr.
OP Emily Maeda Roosevelt 5-3 Sr.
MB Chelsea Hardin Iolani 5-9 So. S Pihana Kea Punahou 5-5 So. DS Tatiana Santiago Kamehameha 5-7 Jr.